Winchester Shotguns For Sale. Buy From Our Huge Range Of Guns. Established in 1887, Winchester are well-versed in manufacturing market-leading shotguns. This is a brand which is synonymous with high quality, reliable guns, which are avilable in a range of designs. Winchester are recognised for creating arguably the finest pump-action shotgun in the world with their Model 1912 or M12. The design of this firearm planted the seed for the development of modern pump-action shotguns from both Winchester and its competitors. Browse our catalogue today and discover Winchester's wide range of new and second hand shotguns for sale. We are the premier marketplace for shotguns for sale in the UK, with ranges to suit all levels and interests. This is a brand new Winchester SXP Waterfowl 12ga pump action with a 28" multi choke barrel. Superb Winchester that is of the top of their range. Crafted to perfection with a brilliant woodern finish. Brand new model Winchester SX4 semi automatic. Includes 3x chokes and stock spacers. becoming hard to find in lovely condition not shot more than 500 cartridges from new great fun gun to shoot copy of winchesters model 1894 but they made these in 410 shotgun down sizing forces sale . New Winchester SX4 Mossy Oak break up camo. Hydrodipped to a high quality, excellent hide gun. Latest SX4 2 plus 1 semi auto features with spare chokes. New SXP Black Shadow 2+1 pump action shotgun. Absolute bargain at this price. A brand new 2019 example of the latest Semi auto from Winchester the SX4. Excellent condition, used twice only, just prefer over and under. Used only a few times so have decided theres no point keeping it. Used 4 times out on the pigeons and 2 at clay grounds. Good condition no dents or damage to stock viewing can be arranged. Shoots well, has a few knocks & marks on the stock. Lovely condition Winchester Model 23xtr Supergrade, the choking hasn't been messed about with, still modified and full. This is the brand new Winchester SX4 Waterfowl 12ga with a 28" multi choke barrel. The barrel is chambered for 3 1/2" steel shot cartridges making this gun a suitable choice for use rough shooting, pigeon shooting or wildfowling. 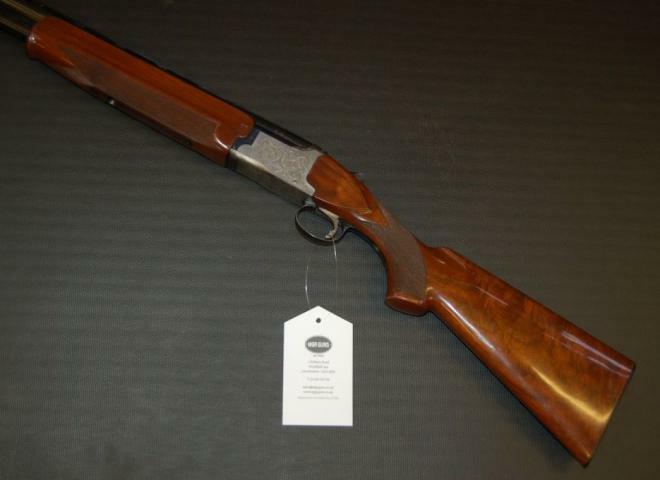 Winchester 23 pigeon grade 28 " barrels 1/2 & full choke in excellent condition pistol grip stock you will not find another in this condition , neck problem forces sale. tel 07817002514. SUPERB VALUE FOR MONEY 3.5'' SEMI AUTO, A PERFECT WILD FOWLING GUN. VERY NICE GUN AND IN EXCELLENT CONDITION. ONLY USED AROUND TWENTY TIMES. SELLING AS NO LONGER REQUIRED. New Winchester SXP Super X Black Shadow Pump Action in black synthetic finished stock. A brand new 2019 model of the SX4 - Waterfowl . The latest Semi auto from Winchester the SX4. A brand new example of the latest Semi auto from Winchester the SX4. Camo (Mossy Oak Break Up) stock variant. lightweight Winchester, ideal for walked up game or an excellent ladies gun, nicely finished with gamescenes. Left hand tow cast 1/8"
3" chambered and steel shot proofed. A robust and reliable pump, smooth cycling. Multi choked with Invector Plus choking. RFD to RFD services if required. Great working tool for shooting pigeons, duck or just bursting a few clays the Winchester SXP gives graet value for money, comes complete with 3 chokes. New Browning SX4 composite 30"